NOTE: Team Library is only available for versions 5.0 and below. 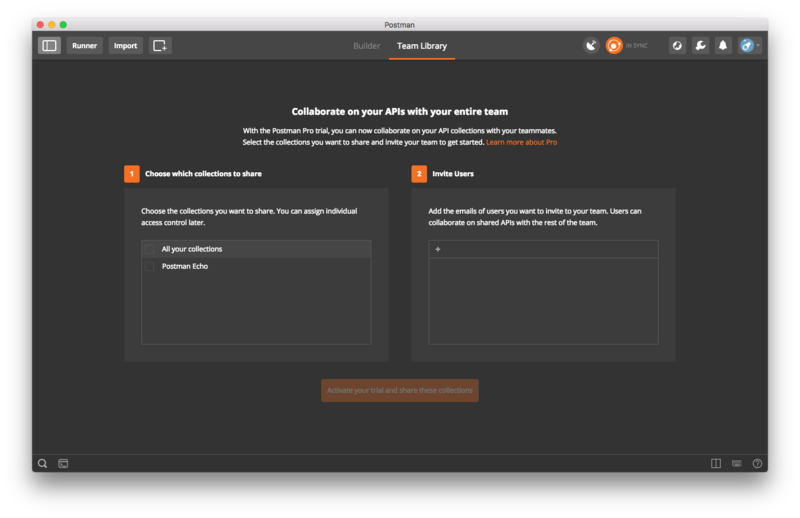 Postman Pro and Enterprise users can use the Team Library to enhance collaboration among teammates. This feature enhances collaboration among teammates in several ways. You can share collections with your team. Collections contain groups of API requests you can organize, add descriptions, attach test scripts, and build conditional workflows. Teams can use environments to create and share a snapshot of a local environment. Users might have different environment variable values, so updates to these values are not synced between shared environments. You can see changes to shared collections in the activity feed. When you subscribe to a collection, you get a synced copy of this collection in your Postman app. If you have edit permissions for the collection, you can make changes that other subscribers to the collection can see. 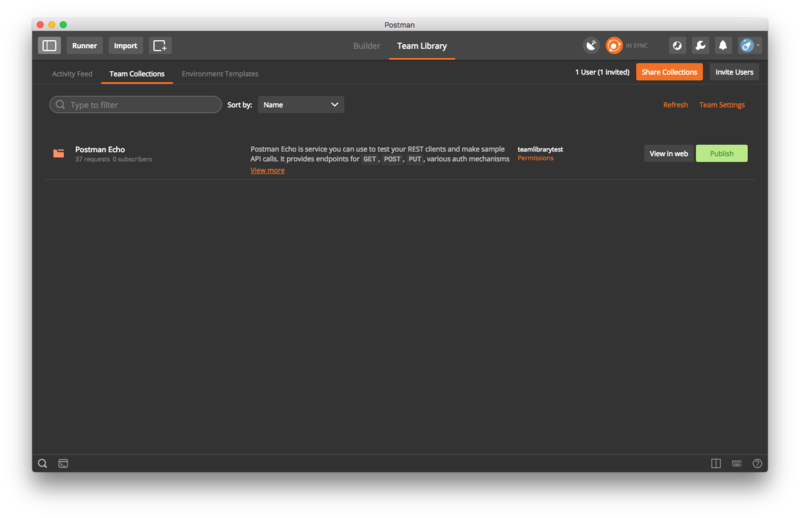 To use your Team Library, open the Postman app and click the Team Library tab on the header bar. If you are visiting the Team Library for the first time, you see this screen. Select the API requests you want to share and save them in collections. Select the collections you want to share. 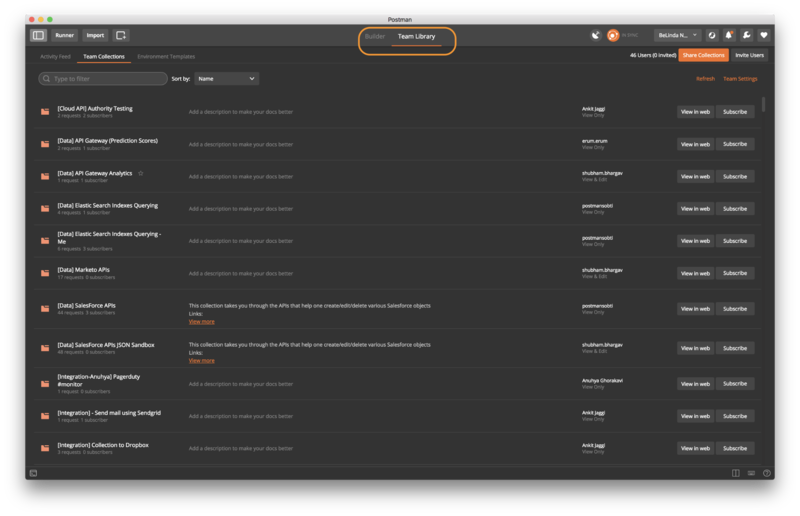 Add the email addresses of the users you want to invite to your Postman Pro team. Click the Activate your trial and share these collections button. When you share your first collection, your 7-day Postman Pro trial is activated. 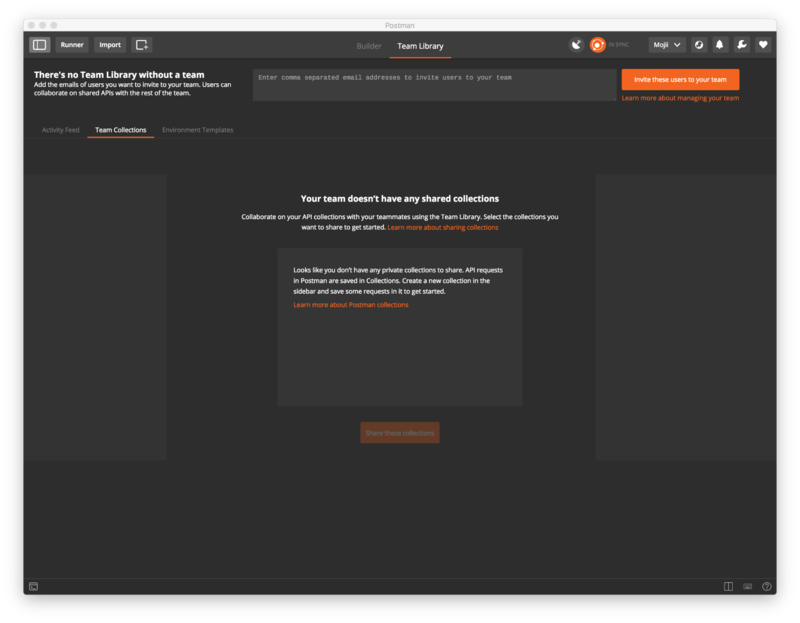 If you are on a Postman Pro or Enterprise team, or if you have activated your 7-day Postman Pro trial, you see this screen when you click the Team Library tab for the first time. Select the collections you want to share, and click the Share these collections button. Add the email addresses of the users you want to invite in the input field on top of the screen. Click the Invite these users to your team button to share collections and collaborate with your team more efficiently.